It can be used to control 'escapes' from other weed management treatments, as a late post-emergent salvage treatment, or for managing herbicide resistance. Late weed control may also reduce grain contamination but a crop-topping application will not increase grain yield. 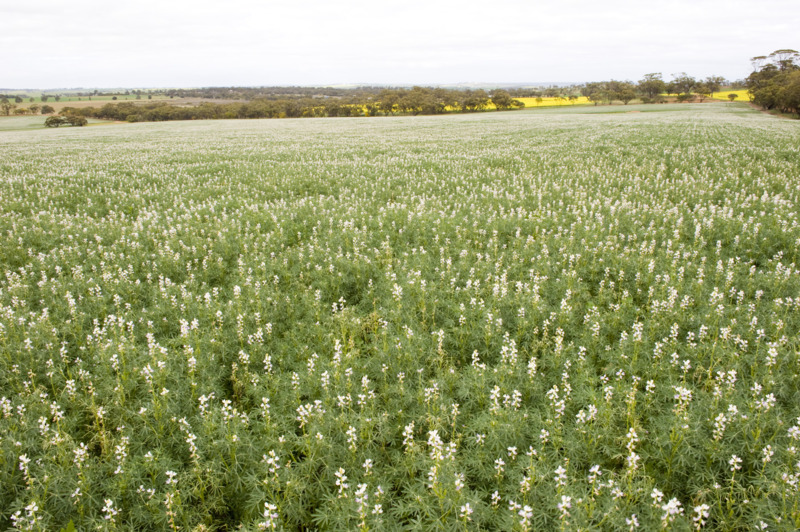 Paraquat 250g/L Gramoxone® (other paraquat products are available) Crop-topping to reduce annual ryegrass seed set Lupins, peas 400 or 800mL/ha 14 days Spray when the ryegrass is at optimum stage (no later than soft dough). Use of higher rate is more reliable. Crop-topping is the application of a non-selective herbicide (for example, glyphosate or paraquat) prior to harvest when the target weed is at flowering/early grain fill. The selectivity of the crop-topping process is dependent on a sufficient gap in physiological maturity between crop and weed. Currently, non-selective herbicide crop-topping registrations are limited to use in pulse crops and predominantly target annual ryegrass. Read product label prior to use as not all products containing glyphosate and paraquat are registered for crop-topping. SpraySeed® is not registered for crop topping. If the target lupin and ryegrass windows are not going to match up and weed control is your highest priority then you may need to consider sacrificing some lupin yield and spray prior to 80% leaf drop. If lupins are at 80% or greater leaf drop they can be crop topped with Gramoxone® with little or no damage to the yield. 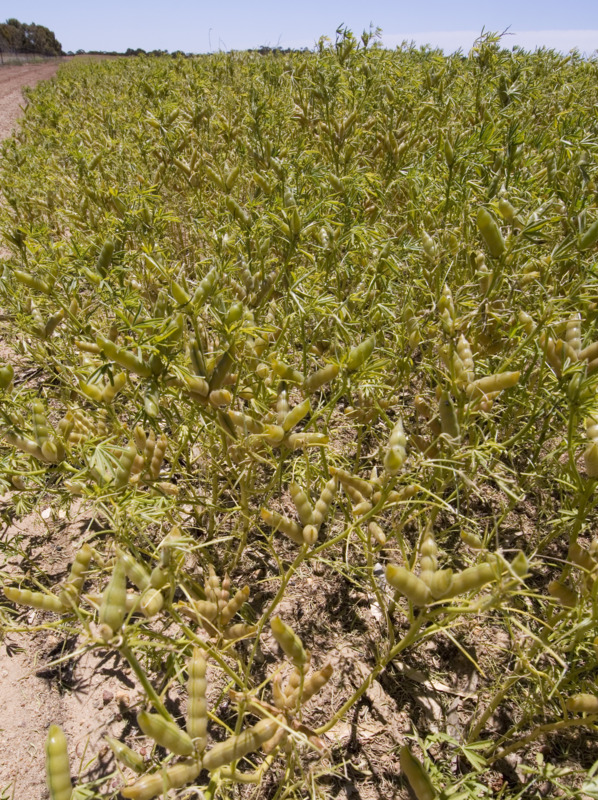 If a lupin crop has small pods (for example, tertiary pods) at the top of the plant at the time of crop topping then yield penalties may be expected. Leaf drop can be defined as the time when the leaves have turned completely brown. Some leaves turn brown and drop to the ground whereas others stay attached to the plant. All brown leaves can be considered as having dropped. Trial work, the label and anecdotal evidence agree that the ideal timing to maximise ryegrass control is from the time when the last of the seed heads have emerged to just before the ryegrass hays off. The alternative way of saying this is from flowering of the ryegrass to the soft dough stage. The following is a guide to assessing the stage your annual ryegrass seed is at. When testing the stage of ryegrass it is best to assess seed located in the middle of the seed head. Just sappy liquid – the seed is 'watery ripe'. This is the stage when seed is forming the cell walls that will be filled with starch. Milky, white liquid – 'milk stage'. This is when starch is being deposited into the seed. The thickness of the sap denotes early, middle and late milk stages. Cluggy, but still soft and like dough – 'dough stage'. As the amount of moisture decreases you move through the dough stages (soft – hard). Eventually no moisture will really squeeze out. When there is very limited moisture there isn’t anything else being added to the seed and it is at the 'firm or hard dough stage'. When squeezed the seed will compress, be firm and still retain its general form. If the seed hardly compresses when squeezed and the seed colour is yellow/brown you are well on the way to 'ripening'. From this point it will be too late to get control. Avoid crop-topping crops that will be kept for seed. Some research has shown that if lupins are sprayed late enough, that is 80-100% leaf drop, that there is little effect on the germination percentage of the lupin seed. However, it is likely that crop topping even at this late timing will have detrimental effects on lupin seed quality (for example, reduced vigour) due to uneven ripening. Clean lupin seed and store it without applying any seed treatments. This will allow you to deliver the grain to CBH should it be found to have a poor germination percentage. Grading out small seed may also help to maximise the germination percentage of the lupin seed. These recommendations should also apply to other grain legume crops that have been crop-topped.